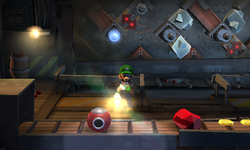 The Maintenance Room is a room inside the Secret Mine in Luigi's Mansion: Dark Moon. The Maintenance Room is accessed by the taking the door on the right in the Workshop Landing. The Maintenance Room has a large generator on the north wall. The area on the south has a conveyor belt running across the wall. Different items, Robombs, red crystals, and coins rolls down this conveyor belt. The door on the left leads back into the Workshop Landing. In the mission Across the Chasm, the player has to make their way to the Maintenance Room. Professor E. Gadd informs to bring power back to the Pixelator in the Workshop Landing. The player has to use the Robombs to destroy the chunks of ice blocking the power to the machine. After power has been brought back to the machine, the Pixelator is activated, but the player is snowed in. The mission ends after Professor E. Gadd calls Luigi. This page was last edited on January 9, 2019, at 16:01.